PLEASE DO NOT EMAIL WITH QUESTIONS ABOUT TIME SLOTS - AS SOON AS WE ARE ABLE TO FINALIZE THEY WILL BE SENT OUT. PLEASE DO NOT ASK FOR A SPECIFIC TIME SLOT - DUE TO THE SIZE OF THIS YEAR'S EVENT, WE CANNOT ACCOMMODATE ANY SPECIAL REQUESTS, TIME SLOTS WILL BE ASSIGNED BASED BY BRANCH/INSTALLTION. We are excited to welcome all actively serving military members and families (including the Guard and Reserve) to our 2018 Military Family Carnival. Please READ all information BEFORE registering - military service is verified by local branches. Q: When & Where is the Event? A: December 15th at the Robinson Town Centre located at Park Manor Boulevard, Pittsburgh PA 1520. (Empty Store Next To Guitar Center on Starbucks Side of Plaza.) Families will be assigned one of 5 different 2 hour time slots based on branch of Service and installation. PLEASE DO NOT EMAIL TO ASK FOR A SPECIFIC TIME SLOT. We will have over 1,000 attendees this year, it is incredibly difficult to manage each child receiving a gift specific to them and we just cannot accommodate individual time slot requests. Q: Who is eligible to attend the Event? A: ALL actively serving military members and their immediate family, regardless of need. This is NOT an event based on need, this is an event to thank military families for their service. This is an extremely popular and well attended event. All military service members signing up will be approved by local bases as actively serving. ONLY children of service members are eligible to attend as well as 2 adults per family. There is no execption to this rule, this is so we can accommodate all families who would like to attend. Please do not list friends, nieces, nephews, etc. ONLY dependents of service members are eligible and this will be verified with bases. Q: Why is a gift list necessary by child? A: This is a very unique event where civilian volunteer children are paired with military children who are attending the event. The civlian child earns the $ (up to $25) to purchase a gift from a military child's wishlist by doing extra chores at home or for family/neighbors. They then pick out a gift, using the wish list as a guide and wrap the gift. 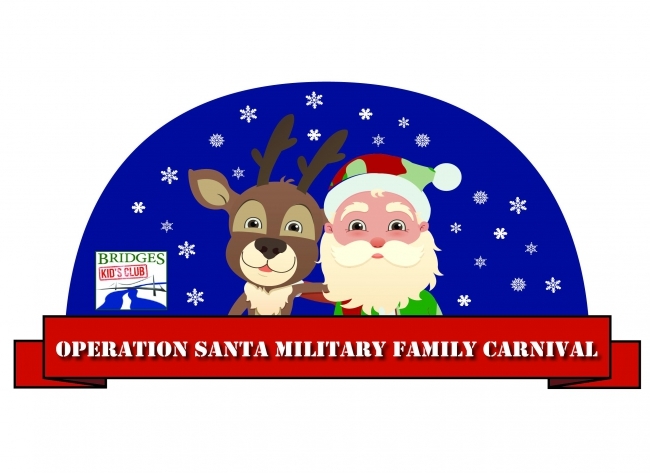 At the event when a military child visits santa and receives their gift, the civilian child "elf" who purchased the gift may be present to witness their gift being opened. Gifts are purchased with a specific child in mind and it gives the civilian child a true understanding of the joy they are able to give to another person. If you have attended our event in the past, you know how magical this experience is for both military and civilian families. Q: What are the restrictions for gift wish lists? A: Please remember that wishlists are to give your "elf" a guide to purchasing something your child will enjoy receiving, it is not meant to be a request for specific items. We ask that you please limit your requests to items valued under $25. Items listed that are valued at more then $25 will be completely remove and replaced with a similar category before being assigned to a volunteer for purchase. For example, if "American Girl Doll" is listed, this will be replaced with "Doll." The more general you can be the better. Very specific items, catalog item numbers, etc will not be accepted and will be replaced with generic descriptions. For example if wish list says "Fisher Price Batman Blue Car, Toys R Us catalog page 12." it will be replaced with "Batman". Please insure you are listing at least THREE options. Listing only one thing really limits our abilites to provide gifts. Examples of perfect wishlists are: "Likes Barbie Dolls, Puppies & Shopkins. Loves Pink." "Paw Patrol, Hot Wheels Cars and Batman." Q: Do all children need to be present to receive gifts? A: YES. All children must be present at the event to receive their gifts from Santa. If children are not present you cannot take their gifts. Again, there are civilian children present who have purchased the gifts for military children in attendance. GIFTS WILL NOT BE PERMITTED TO LEAVE THE PREMISES UNOPENED OR IF CHILD IS NOT IN ATTENDANCE. Please do not ask, as this rule will be strictly enforced. Please do not sign up children that you know are not going to be present at the event. Q: Do gifts have to be opened at the event? A: YES. ALL GIFTS MUST BE OPENED AT THE EVENT. Gifts given at the event are not meant to be saved for Christmas morning. If you do not want your children to open their gifts at the event, please do not sign up to attend this event. A very large part of this event is the experience and interaction of families with one another. If you need assistance for Christmas morning gifts, please see your Family Readiness Officer, they are aware of our programs that can provide support for Christmas morning. Q: Why is there a $5 charge per attendee? A: When we did not have a charge due at sign up for the event, we had many people sign up and then not show up the day of the event. This left a lot of civilian children who worke to purchase and wrap gifts, with nobody to give them to and also resulted in a lot of $ wasted on food and prizes, etc. that were based on the number of people signed up to attend. By collecting $5 per attendee, it has severely limited "no shows". We promise you will receive tremendously more then your $5 admission fee. Q: What is included in the admission fee? A: The admission fee covers all food, activities, games, inflatables, crafts, caricatures, balloon artists, Princess/Star Wars caracter visits, Santa Visit & Photo, Gifts and more. Q: What if I have more questions not answered here? A: Please email Kristi Hilbert at kristihilbert@trwmg.com with any further questions or concerns.